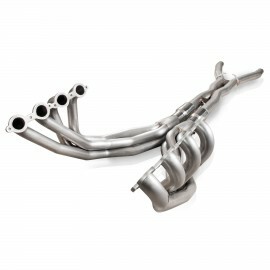 2009-13 C6 Corvette Headers with with 31" long primaries and 3" slip fit collectors. Includes 3" X-pipe, O2 extensions, Accuseal clamps, oil cooler lines, compression fittings, zip ties, cable clamps, etc. Choose between 2" and 1-7/8" diameter primaries, as well as high-flow cats and off-road pipes for your system lead pipes. Fits factory axleback connection point or Stainless Works 2.5" diameter axleback.